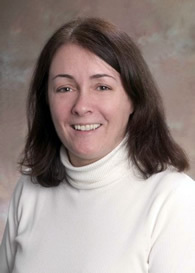 Ruth O'Regan, MD, senior author and the designer of the clinical study. O'Regan is an associate professor of hematology and medical oncology at Emory University School of Medicine. Researchers at Winship Cancer Institute, Emory University are testing whether a combination of two anti-cancer agents can stop the growth of a hard-to-treat form of breast cancer. “Triple-negative” breast cancers get their name because they lack three biological markers that make other breast cancers vulnerable to drugs such as tamoxifen or Herceptin. A well-tested class of drugs called EGFR inhibitors has not been effective against this type of breast cancer by themselves, but doctors think that adding a second class of drugs, mTOR inhibitors, can block cancer cells’ escape route. After showing that this approach -- lapatinib plus rapamycin -- can stop growth in triple-negative cell lines, Winship researchers are testing it in a clinical trial. The laboratory research was published recently in the journal Molecular Cancer Therapeutics. The paper’s first author is senior research specialist Tongrui Liu. The senior author and the designer of the clinical study is Ruth O’Regan, MD, associate professor of hematology and medical oncology at Emory University School of Medicine. She says the rationale for the combination grows out of a concept called “enhanced oncogene addiction.” The idea is that mTOR inhibitors can make cells more dependent on a growth pathway that another drug can attack. Winship researchers have found this approach to be successful with breast cancers that become resistant to Herceptin. EGFR (epithelial growth factor receptor) is a molecule that is hyper-activated in many cancers, such as lung, colon, and head and neck cancer. The drug lapatinib is a chemical that interferes with the function of EGFR. Lapatinib indirectly attacks an enzyme called Akt, which mTOR inhibitors force cells to depend on. Although triple-negative breast cancers share some characteristics, they’re not all the same on the molecular level. O’Regan says researchers are trying to understand what mutations and genetic signatures distinguish patients who have a better chance of responding. To help scientists gather data on this, as part of the clinical study, patients have an initial biopsy and then optional biopsy 6-8 months after the treatment begins. The research was supported by the Wilbur and Hilda Glenn Foundation and the Georgia Cancer Coalition. Trial: "A Study of Lapatinib in Combination With Everolimus in Patients With Advanced, Triple Negative Breast Cancer"
Trial: "Re-expression of ER in Triple Negative Breast Cancers"
JNCI Article: "Targeting mTOR: Something Old, Something New"
News: "Scientific Symposium Looks at Triple Negative Breast Cancer"